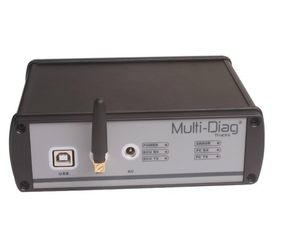 Multi-DIAG Truck Heavy Duty Diagnostic tool is the most powerful diagnostic tool for heavy duty bus, and light vehicles. Multi-diag Truck covers all European trucks, buses and light vehicles. It develope from Europe, the DTCs and data is absolutely accurate, ad michell and alldata, multi-diag truck includes maintenance information, manual, circuit diagram and device parameters.There is no limit to use the Multi-Diag truck software, when you have done with the software 2 years later, you can active again and go on use two years. Please contact us for active. Multi-Diag Truck melt MAN CAT III, Renalt DIAG NG3, DAF VCI 560, IVECO EASY, MB SD Connect C4, Scania VCI2 all function in one.